The influence of European comicbook artists on the world of fantasy and sci-fi is incalculable, yet few reigned more so than Jean Giraud, also better known as Mœbius. It's a topic of great interest to me, but one we won't delve into too much right now. Nor will we dare to delve into Giraud’s extensive body of work; there are plenty of better places for that. Rather we'll focus in on single detail, amongst many, that is particularly salient to our mission; the origins of Star Wars. It came about in a way that is tangentially related to Star Wars itself, when in the mid-70’s cult-filmmaker Alejandro Jodorowsky famously gathered his crew of ‘spirit warriors’ to create a mindblowing, all-singing, all-dancing spectacular adaptation of Frank Herbert's Dune, as covered so splendidly in the documentary Jodorowsky’s Dune. Amongst his so-called spirit warriors, indeed one of the greatest, most inspired pre-production crews ever assembled for film, were a number of heavy-hitters in the world of science fiction. Amongst these were Chris Foss, H.R. Giger, Dan O’Bannon and Jean Giraud (who used the name Mœbius when he did science fiction), all of whom would also go on to work on Alien. I drew “The Long Tomorrow” in 1975, while I worked with Alexandro Jodorowsky on a film adaption of “Dune”. Originally Douglas Trumbull was to do the special effects, but that was not to be so Jodorowsky hired Dan O’Bannon to replace him. Dan came to Paris. Bearded, dressed in a wild style, the typical Californian post-hippie. His real work would begin at the time of shooting, on the models, on the hardware props. As we were still in the stage of preparations and concepts, there was almost nothing to do and he was bored stiff. To kill time, he drew. Dan is best known as a script writer, but is an excellent cartoonist. If he had wished, he could have been a professional graphic artist. One day, he showed me what he was drawing. It was the story board of ‘The Long Tomorrow’. A classic police story, but situated in the future. I was enthusiastic. When Europeans try this kind of parody, it is never entirely satisfactory, the French are too French, the Italians are too Italian … so, under my nose was a pastiche that was more original than the originals. A believer in parody, Dan continued that tradition. As the story was very strong, I immediately asked if he would allow me to play around graphically, with complete freedom, without conventional pyrotechnics, to refocus on the floating point of view. Pete Club’s costume, for example, was almost ridiculous, far from the traditional raincoat of Bogart. It was the same for most of the visual elements. I scrupulously followed Dan’s story. One day I wish we could publish our two versions side by side. As the strip has pleased everyone, I asked Dan about a sequel, but it did not get his attention, so was simply an adventure I never designed. The short comic is notable as one of the major sources of inspiration for Blade Runner; originally serialized over two issues of Metal hurlant (a comics anthology created in part by Giraud himself) in 1976 and in the English translated Heavy Metal in 1977, both heavy sources of inspiration for Ridley Scott. Here’s a two-page spread from part 2, see if you can spot anything familiar to Star Wars fans in it. It just so happened that other comic connoisseurs were coming into their own as film makers at just that time, including George Lucas, who would go into business with Edward Summer to create a comic book art gallery in New York, and Joe Johnston. And as the success of Star Wars became a reality, Star Wars II was put into pre-production, and world immediately started fleshing out its new worlds, creatures and droids. 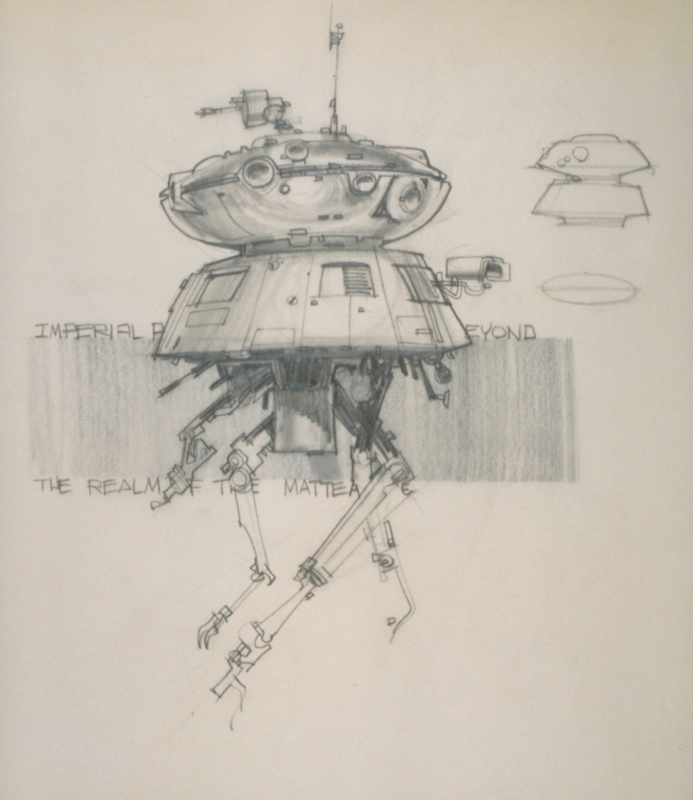 Johnston, a key member throughout the production of the original trilogy and now a world renown filmmaker in his own right, share much of the visual conceptualization with Ralph McQuarrie, and between them they started bringing to life Lucas's early ideas, one of which was an imperial probe droid. 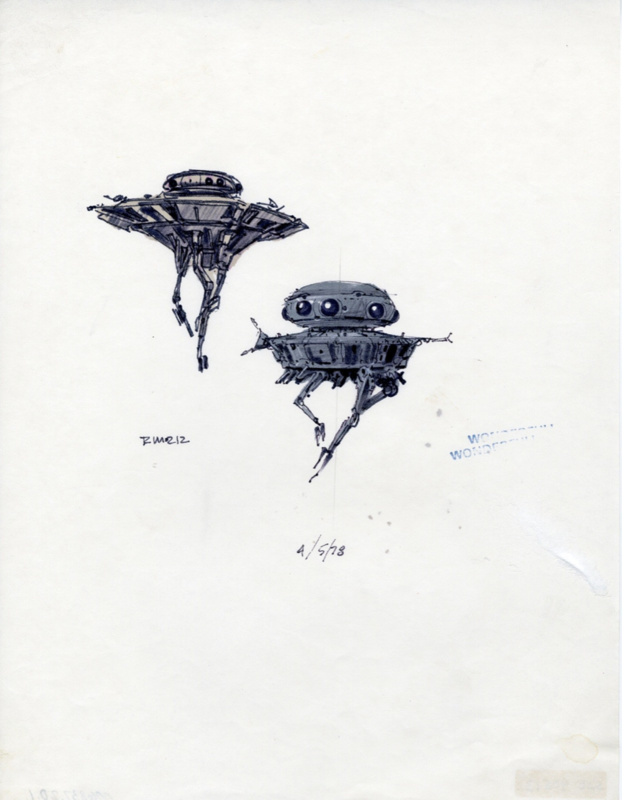 There's your probe droid. A small doodle in the back of a single Mœbius panel, never to appear again. The story supposedly goes (which is my way of saying that I’ve heard, but have so far found no evidence of) that the production team received permission from Mœbius to use his design. That may be true, after all Mœbius did himself go on to produce a number of drawings in the Star Wars universe, and Dan O'Bannon had worked with him, etc. But given how most of the other inspirational borrowings for Star Wars have gone down, I see little reason to believe that this one would be any different. 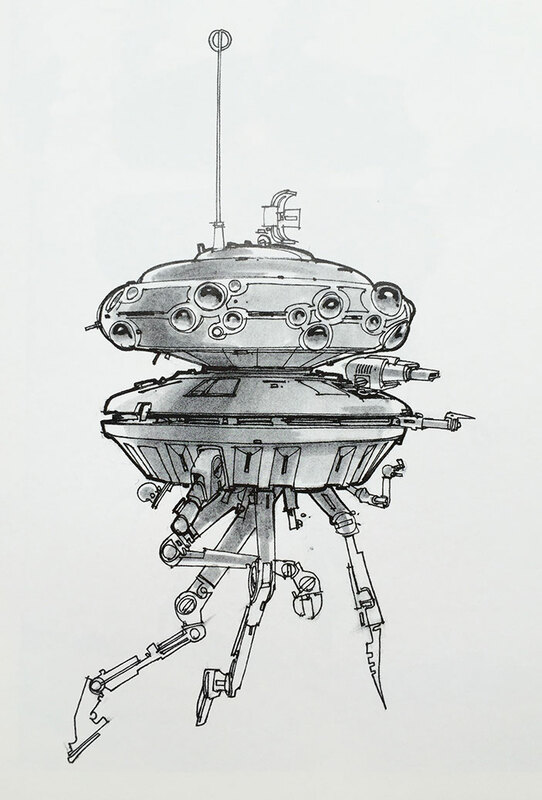 Nevertheless, for it to find its way to the screen in The Empire Strikes Back, the probe droid, also known as the Probot, needed a lot more detailing. It’s easy however, to see how the basic concept remained largely unaltered from The Long Tomorrow and forward, despite a number of alternate designs from both Johnston and McQuarrie. 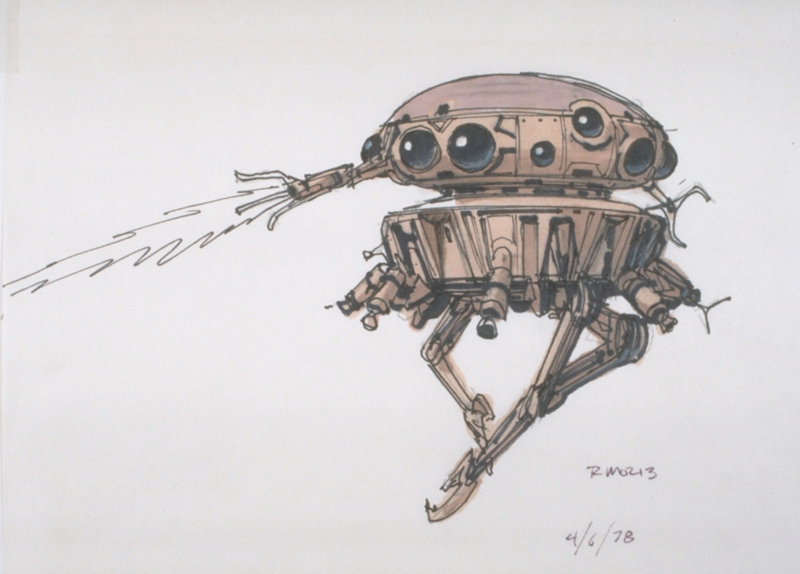 From the dates on some of these sketches (three from McQuarrie, three from Johnston), it seems like McQuarrie did the first round of investigations, through May of 1978, and if I’m reading it right, Johnston came in in August for another round, which strangely goes back to the root of the Mœbius’s original design.